Nobody enjoys painting in the hot summer sun. Using brushes and rollers will make your DIY task more difficult. Painting fences can be especially difficult and time-consuming. Whats the answer to this then? Finding the best HVLP Spray Gun for woodworking. With a HVLP spray gun, you should be able to paint a water-based finish as well as oil based. Water-based is often either called that or waterborne, this seems to be the most popular base. Water-based products do not coagulate inside the spray guns, which mean they do not turn hard. If you would like to thin the paint to get a smooth finish then you have to make sure you clean the spray gun thoroughly afterward as these two mixed together can go gooey and be extremely difficult to clean if left to dry. 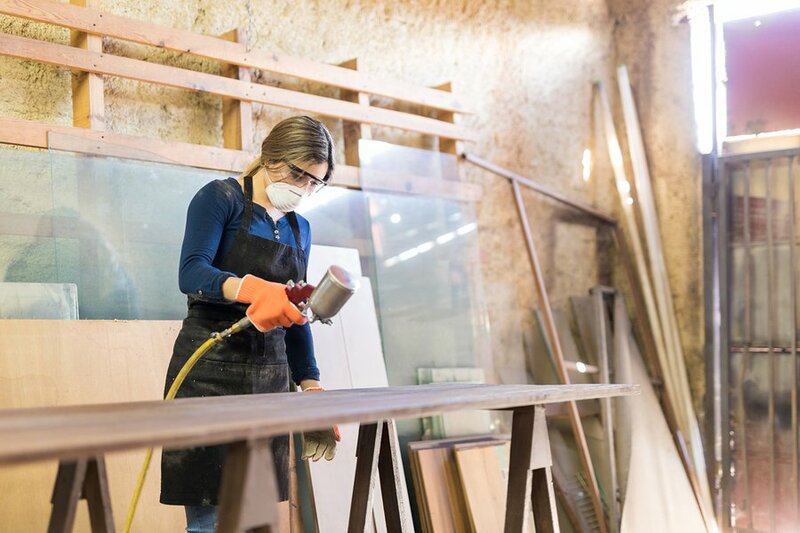 HVLP makes sure that the majority of the spray goes onto your product and not in the air, whereas other spray guns put more finish out into the air. Not only does that mean it is safer for the environment but also it is more cost-effective. HVLP uses low pressure which means more precise rather than others that compress high pressure. You want to look at how uncomplicated it can be, what the painting looks like, and how it can make your life easier. This spray gun has been given incredible reviews by nearly 1000 people and that is something I look for. Good reviews mean good products and this is the least expensive of the three. It is easy to use and can paint hard to reach areas. The 20-foot hose for you to get to any angle and has a powerful two-stage turbine that can spray latex and other thinner materials. It is able to spray with 3 different patterns. It’s handheld but gives the finish of a professional look to whatever you are painting. The power is between 1.50-2.63 PSI reduces overspray of thin materials. Wagner Spray tech brand is the leader in spray paint, rollers, glue guns and many more DIY products which are why they have so many good reviews. This is a solid and affordable choice for spraying a variety of wood. The spray station 5500 is a demo pro system that is used serious woodworking. This is in the middle of the three for the price range and has the attributes to be considered by professional painters. Compact and lightweight, this sprayer has ‘push and click’ spray pattern adjustment. It features a 2mm needle, 13 ft hose and 650-watt motor. All this combined with a 2-year warranty make it a great choice in mid range sprayers. Earlex is a DIY and Professional Power Decorating company, they provide the most advanced products. Since 2013 Earlex is now part of the Wagner Group. This combines the development of this product with the expertise of market leaders, Wagner. So the final one is the most expensive, so with that comes a lot of expectations. Fuji does not disappoint when it comes to their sprayer range. Most of their products are suited to experienced painters who want quality and are knowledgeable with paint guns. This beast of a machine includes non-bleed spray gun, 25 ft hose and 2 stage, 1400 watt motor. Other quality features include adjustable spray pattern, 1.3mm nozzle, and 1 Qt. bottom feed cup. Fiji Spray is market leaders in spray guns and are the leading North American HVLP Manufacturer. Thi is one of the best sprayers available for any painting job. When it comes to painting your wooden furniture with a paintbrush, let’s just face it you could be there for a few days. The spray gun is the most efficient and effective way to get the quality without spending a large amount of time painting. With an HVLP you get the perfect finish, no fumes or no overspray. HVLP has been shown to be the most cost-effective and efficient of all the spray guns. The price range varies on all three so you will definitely find one for you, the companies are all experts in spray woodwork which makes it easier to trust the product. The most important thing is how easy each one is to use and the finish of the painting. The pros and cons of each item will provide the knowledge on which is the best HVLP Spray Gun for woodworking for you.